​This astonishing image was shown in the “Pottery, Glass and Brass Salesman”, May 1911. The accompanying caption simply stated “Photo showing how Col. Will A. Rhodes representing Knowles, Taylor and Knowles and Chas J. De la Croix combined forces in Portland, Maine, recently.” The location was given as the State of Maine Room – Falmouth Hotel. ​There was no further information anywhere in the text of the journal. An entire wall on the right-hand side of the large meeting room in the Falmouth Hotel appears to have been filled with Carnival Glass. Casually posing for the camera, is Charles J. De la Croix. He was a free-lance sales agent who was described in another edition of the “Pottery, Glass and Brass Salesman” as a “well known traveller for the H. Northwood Co”. 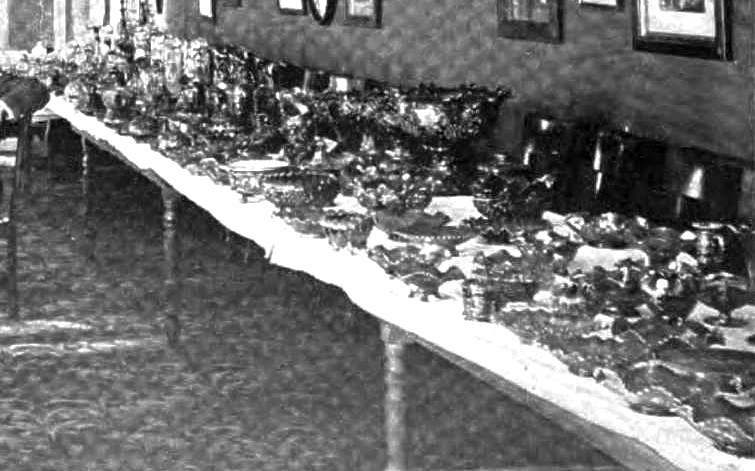 In January, 1911, De la Croix had also represented Northwood at the Pittsburgh trade show, where it had been noted that “lemonade and water sets are shown in a more elaborate manner than heretofore. Many improved effects are noted in the iridescent lines and a number of new specialities and shapes are on view.” A few years later, in 1914, De la Croix opened showrooms on Madison Avenue in New York, in which Northwood’s glass (particularly their new Luna Lighting) took centre stage. ​​Look more closely and what do you see? ​The glass at the far end is indistinct but is probably mainly marigold, while all the glass nearer the camera is probably purple, or darker colours. 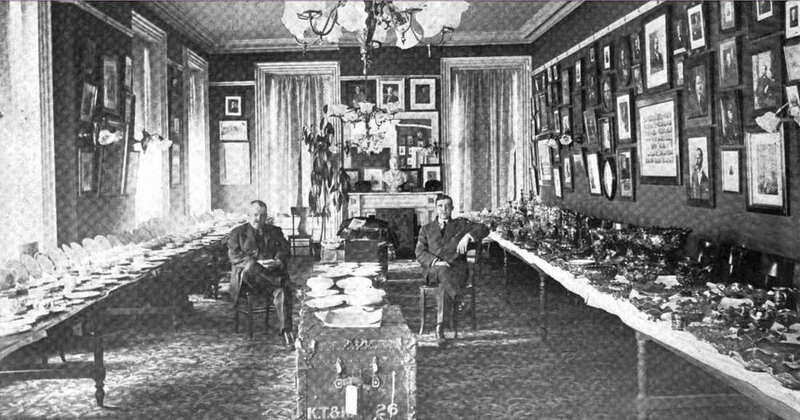 Against the wall (far end) are tankard pitchers - almost certainly Dandelion or Oriental Poppy, judging by the shape - and in front of them there appears to be some table sets, again based on shape. ​Coming nearer to the camera the items are clearer to see. There’s Grape and Cable … lots of it, including several punch sets, indeed it looks as if several sizes were on display. There’s a Grape and Cable centrepiece bowl too and a large Grape and Cable fruit bowl. Maybe also a lidded powder bowl (front, towards the right)? In the centre of the table, at the front, can you spot the familiar appearance of a Leaf and Beads rose bowl? Using shape alone as an identifier, there's also what looks like a Fine Cut and Roses candy (with it's distinctive four little feet), a Daisy and Plume rosebowl, a Fruit and Flowers bon bon, and a Beaded Cable rosebowl. ​The display also includes a wide selection of bowls (ruffled and pie crust edged), but it isn't possible to make out the patterns - except that one bowl at the back of the table (and on the right) seems to be Northwood's "signature" Basketweave" exterior pattern. You would have to believe that Northwood's famous Peacocks (on the Fence) would have featured, as it was undoubtedly one of Harry's masterpieces. Is there anything missing? It is hard to tell ... but we cannot make out any vases. They may be there - perhaps at the far end of the table - but we can't really spot any. Above, left to right: Grape and Cable fruit bowl, purple (courtesy Seeck Auctions); Leaf and Beads rosebowl aqua opal; Daisy and Plume rosebowl, purple. ​Below left: a green Fruit and Flowers bon bon (stippled) with Basketweave exterior, and right, a green Wild Rose bowl. It is interesting to see that the display included a Grape and Cable fernery (front and centre of the table) - it looks very much as though it had its white removable lining inside it (to protect the glass from the plant pots that would have been placed inside it. We know it was originally sold with a white enamelled lining because there was a 1910 Butler Brothers ad (right) offering it "in a holly box" intended for the Christmas trade. ​Grape and Cable fernery, purple. Courtesy Seeck Auctions. The Falmouth Hotel in Portland, Maine was built in c. 1866, and it was described as the city’s “largest hotel, a magnificent structure”. It had 240 rooms and was “fully equipped with all the conveniences of a modern first-class hotel, including an elevator, and bathing rooms on all the principal floors”. Right: an image of the Falmouth Hotel from “Portland and Vicinity” by E. H. Elwell, 1890.